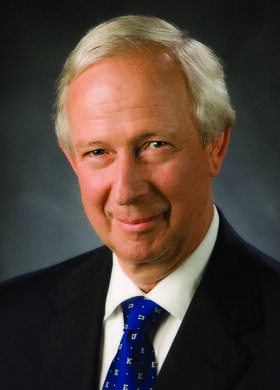 Richard Brodhead, president of Duke University, will explore “The Once and Future Liberal Arts” in a talk as part of the 2014-15 Notre Dame Forum from 5 to 6:30 p.m. Tuesday, November 4 in the Hesburgh Center Auditorium on the University of Notre Dame’s campus. The 2014-15 Notre Dame Forum focuses on the question “What do Notre Dame graduates need to know?” Brodhead will speak on the importance of the humanities in higher education, followed by a discussion between Brodhead and John McGreevy, I.A. O’Shaughnessy Dean of the College of Arts and Letters at Notre Dame. Kasey Buckles, Brian and Jeannelle Brady Associate Professor of Economics, will serve as moderator. To conclude the evening, Brodhead and McGreevy will welcome questions from the audience. Nationally, Brodhead is a leader in education issues and a spokesman for the value of the humanities. Elected to the American Academy of Arts and Sciences in 2004, he was named the co-chair of the Commission on the Humanities and Social Sciences, created by the American Academy of Arts and Sciences at the request of a bipartisan group of congressmen and senators to bolster teaching and research in the humanities and social sciences. The commission issued its report, “The Heart of the Matter: The humanities and social sciences for a vibrant, competitive, and secure nation” in June 2013. Brodhead discussed the report on PBS NewsHour and The Colbert Report. McGreevy and Buckles serve as part of the University’s Decennial Core Curriculum Review Committee, a faculty group named earlier this year that will facilitate the review process of Notre Dame’s current core requirements. For more information, please visit forum.nd.edu.